Cookies for breakfast? You bet! I'm not talking about a certain boxed cereal with fluffy little bits that leave you hungry an hour later, I'm talking about chewy, crunchy go anywhere granola cookies with all the stuff you want and none of the stuff you don't. 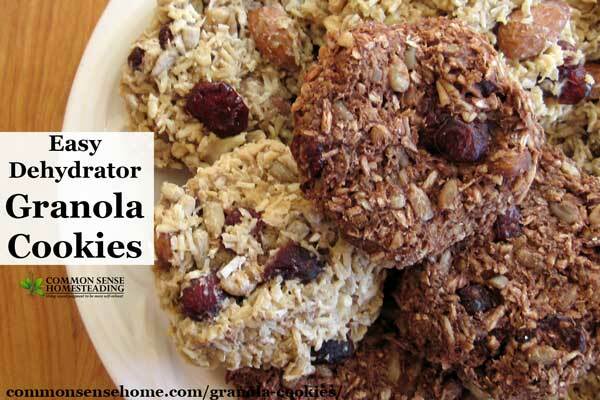 These easy granola cookies can be gluten free if you use certified gluten free oats. (Oats do not naturally contain gluten, but can be cross contaminated.) They are also casein free (when the oats are soaked with vinegar) and soy free. 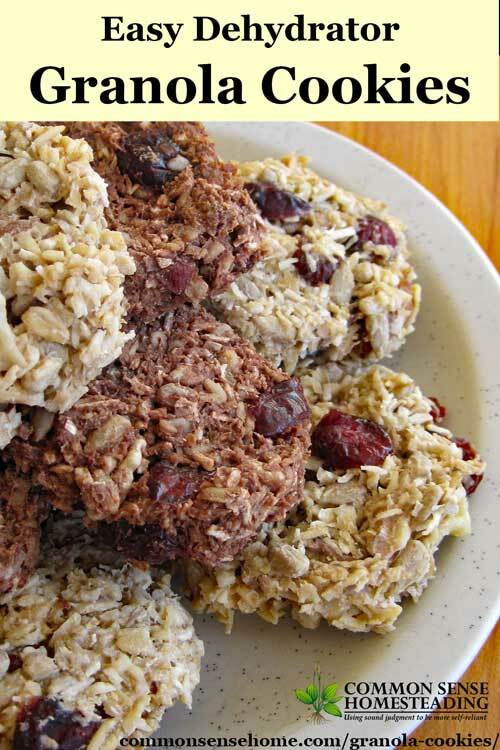 My husband ends up eating breakfast on the run quite a bit, and rather than having him hit the drive through on the way to work or surviving on boxed granola bars, I started hunting for a good soaked granola bar recipe. I finally settled on a recipe from Sustainable Eats. The original recipe was a crunchy granola, which Annette modified by soaking the oats overnight (to make the oats easier to digest). 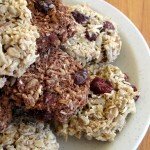 Her family liked to eat it as a granola cereal, but she said the soaked version turned out more like a breakfast cookie. That sounded good to me. 1/2 cup melted coconut oil – My favorite is Nutiva. Soak oats overnight by putting them in a bowl and adding enough water to cover, plus a couple of inches (they will expand) and two tablespoons whey, buttermilk or vinegar. In the morning, place the oats in a colander and let drain one hour before proceeding with recipe. 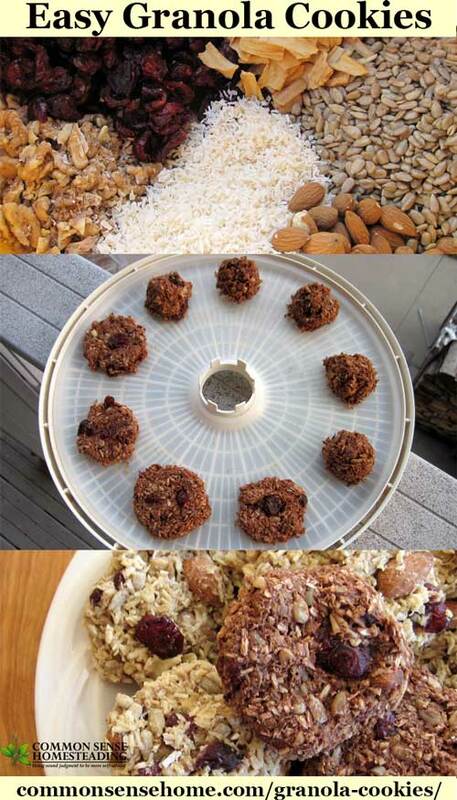 Mix together oats, coconut, nuts, and sunflower seeds and fruit, if desired. This batch used dried cranberries and dried pears, along with both walnuts and almonds and sunflower seeds. Blend coconut oil, honey, molasses and salt. I usually use 1/2 cup honey, but you can use more if you like your bars a little sweeter. Pour over dry ingredients. Mix thoroughly. Dry between 135° and 115°F, overnight or as long as needed. About halfway through, I peel them off the sheets and move them to racks only, and flip them over so the less dry part is exposed. Note: the granola will harden as it cools. Adding dried fruit will soften the granola, which is just fine for us as we prefer a chewy granola bar. Store in an airtight container for 3-4 weeks. My first batch I did at around 135°F and they dried in around 12 hours. The second batch I dried at around 115 – 125°F and they took around 18 hours. As Annette notes, the lower the temperature the more “true” the flavors and live enzymes from the honey remain. I added about 1/4 cup dark cocoa and a teaspoon of cinnamon to one batch to switch things up a bit. My friend, Leigh, added 3/4 cup organic, creamy peanut butter and 1/4 cup of extra dark cocoa and substituted 1/2 cup dates, 1/2 cup sunflower seeds and 3/4 cup pepitas for the shredded coconut. I mention crispy nuts and crispy seeds in the recipe. For those who are not familiar with these options, the nuts or seeds are soaked overnight in salt water, and then dehydrated. This helps to make them more digestible. (More on crispy walnuts here.) You can use raw or crispy – or none at all. Feel free to experiment with your favorite nuts, seeds and dried fruits. I mix and match with whatever I have in the cupboard. For longer storage, you can also place these in the freezer. They also make nice gifts for people on the run. I hope you've enjoyed this recipe. Don't forget to Pin, Like and Share. An easy make ahead breakfast option with fruits, nuts and seeds. Soak oats overnight by putting them in a bowl and adding enough water to cover, plus a couple of inches (they will expand) and two tablespoons whey, buttermilk or vinegar. In the morning, place the oats in a colander and let drain one hour before proceeding with recipe. Mix together oats, coconut, nuts, and sunflower seeds and fruit, if desired. Blend coconut oil, honey, molasses and salt. I usually use 1/2 cup honey, but you can use more if you like your bars a little sweeter. Pour over dry ingredients.Mix thoroughly. Use an ice cream scoop to make little balls of dough, and then flatten slightly to make a cookie shape. Place on a well-oiled dehydrator sheet (I apply coconut oil to my sheets). Dry between 135 and 115 degrees, overnight or as long as needed. About halfway through, I peel them off the sheets and move them to racks only, and flip them over so the less dry part is exposed. Store in an airtight container for 3-4 weeks. You can shape them by hand, too, but the scooper makes it so much easier. The granola will harden as it cools. Adding dried fruit will soften the granola. Originally published in 2013, updated in 2017. These look great. I'm totally bummed out since I don't have a food dehydrator *yet*. I'm hoping Santa brings me one! Reposting my comment…saw too many spelling errors – need to proof read more closely! Oh, WOW! Thank you for sharing this. I've been looking for a granola type bar that wasn't loaded with unwanted ingredients and that would hold together. So many of them don't hold or end up super crunchy that they crumble as you eat. I like the dehydrator idea…beats the use of an oven and the nutrients and flavor will be kept. And, I have all the ingredients, except the dried apple on hand. Also have dehydrator! This is going on my to do list for the week. motherhen – Annette originally dried these in the oven at very low temp, so that may be an option for you. Pamela – I was in the same boat (with respect to the recipe). The dried apple is optional. I added a link back to the post where I made my cinnamon apple slices. I just crumbled these into bits and added them to the bowl, as we still have plenty on hand. Was thinking this is a good basic recipe to tweak around with and put other dried fruit combinations in. Golden raisins, blueberries, pineapple, mango, etc….! Yep – I agree. I figure any dried fruit is fair game as long as you don't mind the fact that it will soften the granola. I may have to try some strawberries, blueberries, raspberries or cherries, as we still have those in the freezer from the summer and I could pop them in the dehydrator. They look delicious, I too will have to try in the oven…after I get all the ingredients. My kitchen isn't nearly as healthy as yours!! LOL – I just bought some mongo quantities of ingredients through our natural foods buying club, so now I am really committed. 25 lbs coconut, 10 lbs oats, 10 lbs sunflower seeds, gallon coconut oil, 5 lbs dried cranberries, 20 lbs Real Salt – the pantry and freezer are stocked. A friend's got a lead on some bulk local honey, too. Anything with coconut oil is great, and to think I didn't used to like the flavor…??? Looks yummy! I'll have to try these out. So glad you finally had time to stop by! 🙂 These have become a staple for us now, both w/ my husband when he's traveling and for me when I'm in a hurry and need something nutritious. I like that I can make up a big batch that lasts a couple of weeks – very handy. I took some with when we went to visit my mom and rest of the family and they liked them, too. Hey, I thought I had seen this recipe before, then I got to the end and saw why – I even commented, my memory is SHOT! Thanks for linking to it again in today's post. I'm curious if you use "crispy" nuts and sunflower seeds? I'll probably try it that way. I confess I haven't yet "crisped" my nuts and seeds, but I'll be tackling that soon. Baby steps. I figure if I do up a big batch I can keep them in my freezer just like I do my regular nuts and have them when I need them. Ideally everything is sourced local and/or organic. Do I add the coconut oil to the honey/molasses mixture? It doesn't say. Yes, all the wet ingredients are mixed together. Thanks for pointing out that typo. I will fix the recipe. I am going to try this in the next couple of days. I am borrowing my Mom's dehydrator. So excited! Good luck! These are messy, but fairly easy. Yum, my kids and I will be trying these out next week; thanks! You're welcome, Katie. Thanks for stopping by. Oooo..I've been meaning to finish building our sun oven, but we haven't had much sun this summer! Please stop back and tell me how it works out. I can’t wait to try this recipe. The only thing missing are chocolate chips, but then again I suppose they would melt in the dehydrator. Cant wait to try the recipe, about how many does it make ? I’m not exactly sure, as I never make them quite the same size. The dehydrator gets pretty full, and we have enough to last us several weeks. I’m glad you like them, and appreciate the link back. Thank you, Melissa. We’re not off-grid (at least power-wise), but maybe someday. Right now we’re just working to combine old and new into something that works well for us (and hopefully for others as well).